Things are so interesting in my yard right now. At night we’ve got a Barn Owl hanging out and screaming like a murderous woman. Apparently, this species of owls is a rarity and we’re privileged to have one in our area. 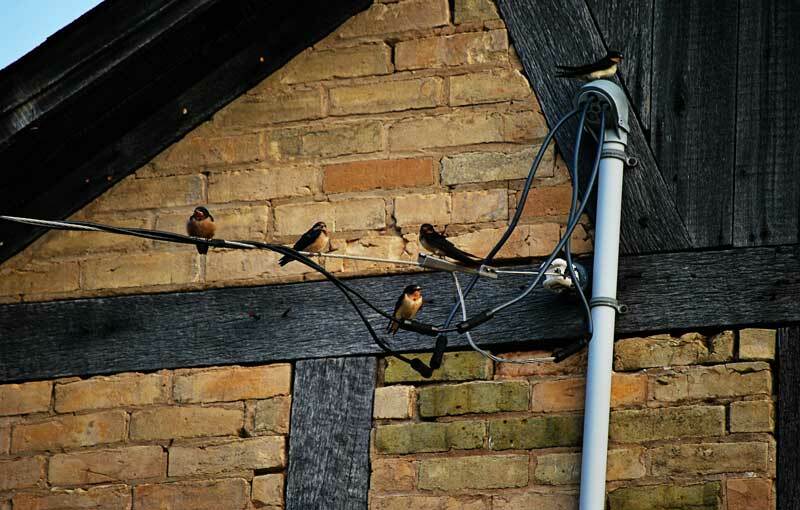 During the day, we have swarms of barn swallows perching on our wires. I love these birds. They’re particularly fascinating in August when they’re all aflutter with excitement and chattiness. I know they’re getting ready for their trip southward and every day I watch to see if they’re still here. Then, all the sudden, hey, they’re gone. Every year I have a sense of melancholy when, once again, I’ve missed the birds’ departure (like, do I think they’re going to come and say good-bye?). It’s such a blatant reminder that summer has flown by and no matter how much I’ve accomplished, there’s always more I wished I’d done. Like keep up with my podcasts. Remember, I was going to try doing one a month? Well, that sure fell by the wayside. Just so I can say I’m sort of keeping up, here’s a short clip of the swallows twittering away and our windmill going ‘clunk,’clunk.’ Pretty exciting, eh? It’s to satisfy you until tomorrow when I have a really good podcast on the gig life—not really about birds, but well worth chatting about.